Funeral services for Jesse Earl Drumright, 91, West Plains, Missouri, will be held at 10:00 a.m., Wednesday, April 11, 2018 in the Rose Chapel at Robertson-Drago Funeral Home. Mr. Drumright passed away at 10:50 a.m., Monday, April 9, 2018 at West Vue Nursing Center. He was born April 4, 1927 in Howell County, Missouri, to Elmer C. Drumright and Elsie E. Downen Drumright. On December 5, 1947, he was married at West Plains, Missouri, to Ella Callahan. 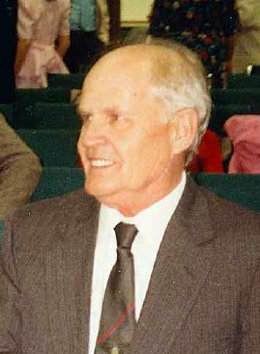 Mr. Drumright was a long time farmer and had worked for many years at International Shoe Factory and Amyx Manufacturing. Jesse was a deacon at Hope’s Rest Primitive Baptist Church; he loved his God and Church. He was a hard worker and wonderful family man. Mr. Drumright was a gifted musician; as a small boy at the age of seven, he began playing music. He played many different instruments throughout the rest of his years. He is survived by his wife of seventy years, Ella Drumright; four children, Janice DeBoard and husband, Gary, Gorden Drumright and wife, Lois, Frank Drumright and wife, Rita and Steven Drumright and wife, Vicki; twelve grandchildren, Craig Drumright and wife, Julie, Kelli DeBoard, Meggan Richardson and husband, Lance, Jessica Adams and husband, Bobby, Hayden Drumright and wife, Audrey, Dalton Drumright and wife, Chanda, Lizabeth Huntley and husband, Chris, Ronnie Drumright, Floyd Drumright, Barbara McIntosh and husband, Tre, David Drumright and Chris Drumright and wife, Kasey; many beloved great-grandchildren; and one brother, Ed Drumright. His parents and one grandson, Jason DeBoard, preceded him in death. Burial will be in the Hope’s Rest Cemetery. Memorial contributions may be made to Riverways Hospice or Ronald McDonald House and may be left at Robertson-Drago Funeral Home. Frank and Rita, so sorry for your loss. Will keep you and your family in our thoughts and prayers. Family…….so very saddened to hear of Jesse’s passing. He was a strong force in the music of this area and will be missed so very much. I have so many good memories of music parties and jams…………….and Jesse right in the middle of it. Good memories. Our thoughts and prayers are with you all. So very sorry for your loss. So sorry for the family’s loss. Thoughts and prayers will be with you at this time. We are so sorry for your loss. Prayers will be for God to give you peace and comfort. Frank, Steve and families. My thoughts are with you all. Many hugs and prayers. Sorry to hear of Jesse’s passing!!! I remember as a little girl going to their house for music parties!!! Those were the good old days, and lots of fun!!! Ella always had something good to eat too!!! Thinking of you all!!! I’m so sorry for your loss. Prayers for all.